Harden mania has owned the NBA for the better of two months now. But just how historic as the “Beard’s” reign of terror been? And how long can James Harden maintain this streak? For fans of basketball, many of you may be familiar with the NBA 2K series. The video game where kids and fans alike can play as their favorite players and glorify them. That’s beside the point. However, there is a reference to be made because of 2K. You see, the streak that James Harden has been on the last two months has been video game-esque. Regardless of how fans feel about the guy, he is the undisputed MVP up to this point in the season. In fact, his numbers are so ridiculous, you probably would mistake them for video game numbers. Let’s take a look at some of Harden’s January stats and total season stats. 45.4 PPG, 9.1 RPG, 6.4 APG. 1.2 BPG, 2.4 SPG, on 44% shooting from the field. While his efficiency suffers at times, with the volume of three point shots he fires, Harden is having a career year. In fact, he has single handily carried the Rockets to a 29-21 record, good for 5th in the West. Also, to take into consideration, he has done this with multiple injuries to his supporting cast. Chris Paul has recently returned from a hamstring injury, and Clint Capela still has about a month before he returns from a thumb injury. Along the way, Houston has traded away Carmelo Anthony and acquired Kenneth Faried. The latter which has been a great addition to the team. While the team has been getting healthier, this is all about Harden. In fact, his January puts him in very elite company. This is the first time a player has averaged over 40 points for a month since 1963. The last player to do it? Wilt “The Stilt” Chamberlain while averaging 45.6 points over an entire month. However, this steak is even crazier because teams have no idea how to defend Harden. 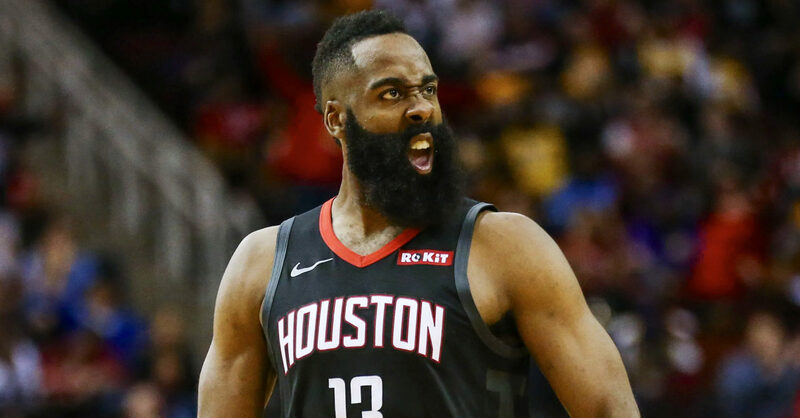 Even teams considered elite, OKC, Golden State, Denver, Boston, etc, have failed to truly slow down “The Beard.” His last outing against the New Orleans Pelicans saw Harden score 37 points in a loss. Despite the loss, those 37 points push Harden’s 30 points or more streak to 24 games in a row. There are several ways to view Harden’s season so far. One could say that Harden’s numbers are over glorified because of the lack of better teammates. Perhaps when the other star players recover he won’t have to do so much. Maybe critics will say his ISO style allows him to succeed in the regular season but leads to failure in the postseason. Regardless, Harden is the man right now. While it is true that the injuries have allowed his ISO style to dominate, critics forget this man literally can do everything. His defense has greatly improved, despite the naysayers. He still turns the ball over, but the return of CP3 should decrease his on-ball need. And, most importantly, Harden is the master of drawing fouls. And I know fans hate that about his game. Despite the hate, the fact of the matter is Harden can get his way at the foul line. And he’s pretty damn good at it. Dismiss the “refs on his side” remarks. LeBron James, Kevin Durant, Michael Jordan, Magic Johnson, the list goes on of stars who get the benefit of the doubt. Every NBA Star in the history of this league has influenced the officiating in their era. The case is no different for “The Beard” here. Just how good has Harden been at drawing contact? Well, he leads the league in free throw attempts and free throws made categories. FTA 11.9, FTM 10.3 on 87% shooting from the charity stripe. In other words, he draws contact and converts at the line. Basically, don’t foul him. That’s easier said than done, however. And teams know that. There are ways that can be suggested to defend Harden. However, he seems to have an answer for everything thrown his way. Drive him off the three-point arc. He can drive to the basket and finish, or throw a lob, or draw contact. Next. Perhaps force him to go right instead of left, after all, he is a lefty. But, Harden has great work on his ability to go right. Is it unorthodox for him still? Yes. However, just like his floaters, he has also worked on that aspect of his game. So what can be done? What makes it so hard to guard this man? Well there is one overlooked aspect to his game. First of all, let’s get some things in order. Harden plays for the team that is analytics-driven. In fact, the Rockets believe that shooting more threes, and finishing at the rim is the most effective way of scoring. True. Therefore, Houston utilizes less than 20% of the mid-range shot in their game plan. Basically, the Rockets have eliminated the mid-range shot from their repertoire. That means the other 29 teams have a basic game plan against Houston. Drive them off the three-point line and defend the paint with multiple defenders. Keep Harden off the line, and force the role players to make shots. Here’s where the plan gets twisted, however. You see, the aforementioned points that make Harden unstoppable as it is are listed. But, there is one more thing we missed here. Harden has taken advantage of the lack of attention to detail on defending the mid-range area. If he is shut off from the paint, closed out at the three-point line, and can’t find teammates, then he has a trick. A little step back inside the arc and he creates space for a mid-range shot that he is more than capable of hitting. In essence, guarding “The Beard” is a tough assignment, even for the best defenders. The streak can’t last forever, but it has been fun to watch. The step back three-pointer is Harden’s signature move at this point. And it is equally as satisfying every time it goes in. At this point, teams in the West must be wondering what kind of defense successfully stops this man. With the Rockets slowly but surely getting healthier, it will be interesting to see where this team ends up in the standings. Whoever gets Houston in the first round better prepare. This team is no easy out. Next up for Harden and the Rockets, The Denver Nuggets at the Pepsi Center. Can “The Beard” make it 25 straight of 30 plus? The NBA world will find out on Friday. Until next time, Red Nation!